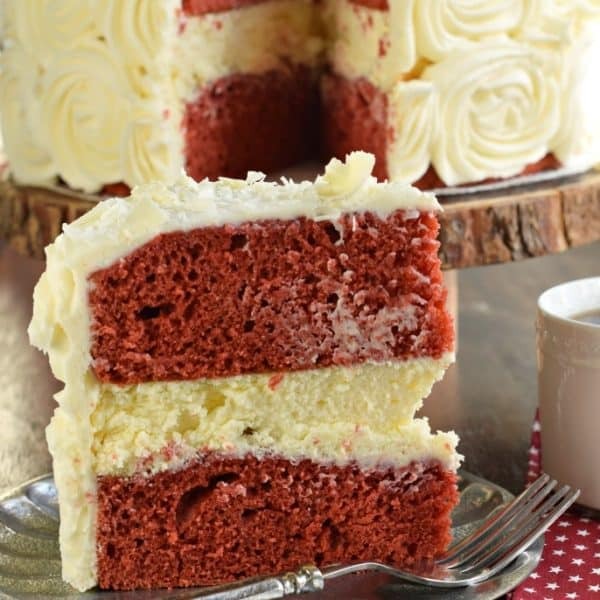 The BEST Red Velvet Cheesecake Cake recipe starts with two layers of homemade red velvet cake with a layer of cheesecake in the middle. Topped with delicious cream cheese frosting and white chocolate curls, you’ll want to make this cake for friends and family every holiday! It’s here friends. 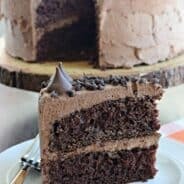 The cheesecake cake recipe that y’all have been requesting for years! Ever since I debuted my first cheesecake cake recipe, this Pumpkin Cheesecake Cake, I am frequently asked if I have a red velvet cheesecake cake recipe. Well the answer is now yes. It’s perfect timing for Valentine’s Day too! You might be wondering though. What is a Cheesecake cake? It’s exactly as it sounds. A rich, creamy cheesecake between two layers of cake. Frosted to perfection. I’m a big fan of The Cheesecake Factory, so when I was told they carry this delightful treat, I was happy to oblige in creating a copycat recipe, of my own making. Because we all know that The Cheesecake Factory is ridiculously priced for ONE slice of cake, let alone the whole cheesecake. Today’s Red Velvet version is crazy good. A lot of people have concerns making red velvet desserts because of the amount of food coloring needed to achieve that bright red color. Here’s my tip to you. Purchase this Americolor Super Red Gel Food Coloring. I use all gel food colorings because one drop goes a long way. I used only 1/2 tsp of red food coloring to get this bright red color, unlike many other red velvet cakes that need tablespoons of coloring! Now that you’re stomach is rumbling for a slice of cake…let’s get to it! You’ll want to make sure to read the recipe before starting. Making a cheesecake cake can be timely, but can be broken up over several days if you prefer! Creating the ultimate dessert recipe can take time, but the end result will be worth it! You can read all the reviews on this Carrot Cake Cheesecake Cake recipe and tell that it’s every bite is worth the effort. First, you’ll need to make your cheese cake layer. I usually make this the day before (or more)! The reason is because after baking and cooling the cheesecake I like to freeze the cheesecake layer. This keeps it fresh until ready to assemble, but it also makes handling it and creating the center layer a little bit easier. It thaws quickly, so there’s never a concern that it will be frozen by dessert time! The biggest difference with baking a cheesecake and baking today’s cheesecake filling is there is no crust on today’s cheesecake layer. To start, preheat oven to 325 degrees F. Place a large roasting pan with at least one inch of water on the lowest rack in the oven. Most cheesecake recipes require you to use a water bath. However, by placing the water on the bottom rack of your oven, you’ll get the same benefits (increased moisture to your cake) without having to wrap your springform pan in foil. You will however want to place a circle of parchment paper in the bottom of your 9-inch springform pan. I purchased these 9″ parchment paper circles on amazon and they have been a lifesaver, for cheesecakes and cakes! You’ll want to use one today (or cut your own circle out of parchment paper, not wax paper) because there is no crust to today’s cheesecake. The parchment paper will have you remove the cheesecake from the pan. Also, spray the inside of the pan with nonstick baking spray (the kind with flour in it). Set aside. In a large mixing bowl, beat cream cheese with granulated sugar for 3 minutes, until light and fluffy. Add in kosher salt and eggs, one at a time, beating well after each addition. Beat in sour cream, heavy whipping cream, and vanilla extract. 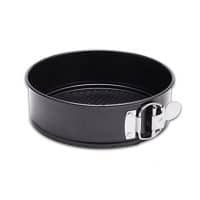 Pour into prepared 9″ springform pan. Place pan in center of oven. Bake cheesecake for 45 minutes. Turn oven off and let cheesecake sit in warm oven for an additional 30 minutes. Remove from oven and cool completely on wire rack on counter. When cooled, run a knife along the edge of the pan. Release springform and cover plate with cheesecake with plastic wrap. Freeze for at least two hours, or several days. 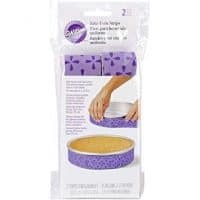 When ready to assemble cheesecake, remove plastic wrap, place frozen cheesecake on layer of cake and remove plate and parchment paper circle before topping with second layer of cake. 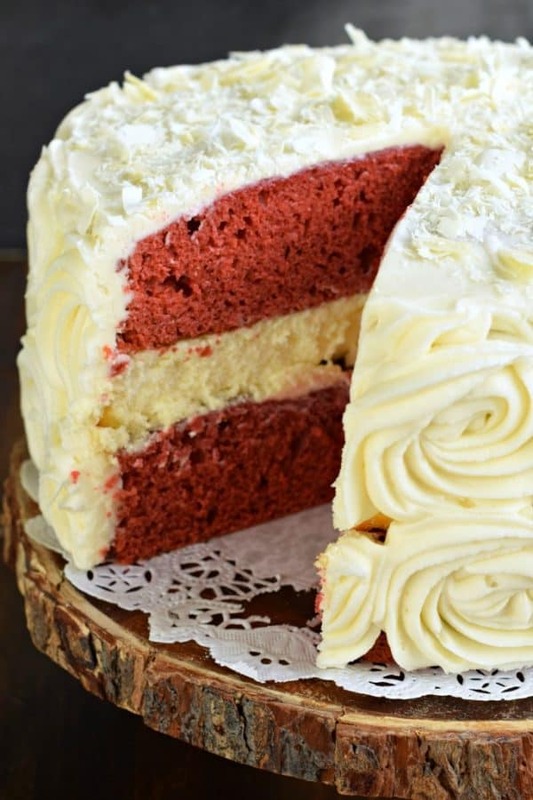 You can either use a boxed mix for red velvet cake and follow the directions to make two 9-inch cakes. Bake according to package directions and cool completely. 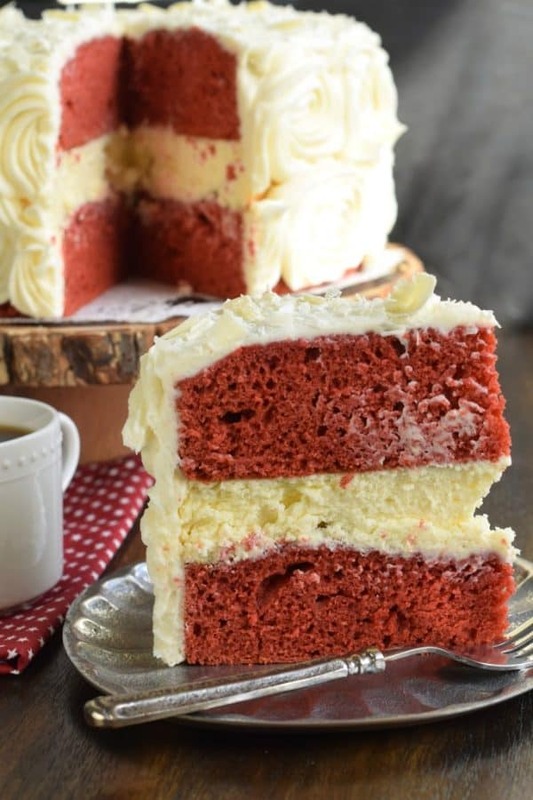 Or you can bake a from scratch red velvet cake recipe like I used below! I used my recipe for Red Velvet Cupcakes to create today’s cake. In a mixer, blend vegetable oil, buttermilk, eggs, vanilla, and food coloring until combined. I don’t usually keep buttermilk on hand, but I always have a container of this, which is perfect for all my buttermilk needs, especially these Buttermilk Brownies! Once blended, slowly add in dry ingredients, the flour, sugar, baking soda, kosher salt, and unsweetened cocoa powder. Beat on medium high for one full minute. Pour cake batter into greased and floured 9″ cake pans. I like to also put a parchment paper circle in the bottom of these pans. I also use these bake even strips to keep the layers flat on top so I don’t have to trim any domes off my cake. LOVE them! Bake cakes for 32-34 minutes, until a toothpick inserted in the center comes out clean (and the sides will pull away from the pan). Remove from oven and place on wire rack to cool completely. You can bake the cakes the day before assembly if preferred. Cover completely with plastic wrap when cooled and store at room temperature for 24 hours. So you’ve made it this far. You have your cheesecake in the freezer. Your cakes are either cooled on the counter or you covered them yesterday to assemble today. How it’s time to make the frosting. In a large mixing bowl with an electric mixer, beat butter and cream cheese together until well blended, about 3 minutes. Add in vanilla extract, powdered sugar, and heavy cream. Blend for about 3-4 minutes, scraping down the sides of the bowl as needed. If needed, to make your frosting creamier, you can add a little more heavy cream. Now you’re ready to assemble the cheesecake cake. 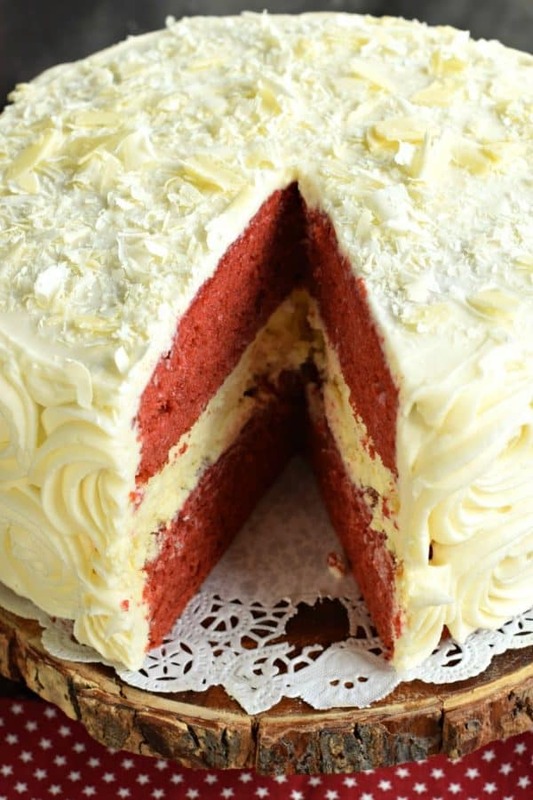 First, place your first layer of red velvet cake on a cake platter. Next, place your frozen (or refrigerated) cheesecake over the cake (make sure to remove the parchment paper circle). Place your second layer of cake over the cheesecake. There’s no need to add any frosting to the center of the cake! Frost the cake. 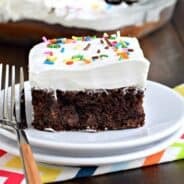 You can either spread the frosting all over the tops and side of the cake using an offset spatula. Or, you can try your hand at making roses on your cake. To do this, fill a pastry bag with frosting. Take a second pastry bag and using a star tip, place that on the bag, and insert your frosting bag into this one (this helps with cleanup since I like to use disposable bags). Pipe small rosettes onto the side of the cake. I made the top of the cake smooth. For a final garnish, I added some white chocolate curls/pieces to the top, just like The Cheesecake Factory. To do this, melt 2 oz bar of white chocolate according to package. Spread melted chocolate onto a cookie sheet. One it’s mostly hardened, use a spatula and scrape the chocolate to create curls or pieces. Sprinkle over the top of the cake. Use a good quality white chocolate for this! There you have it. 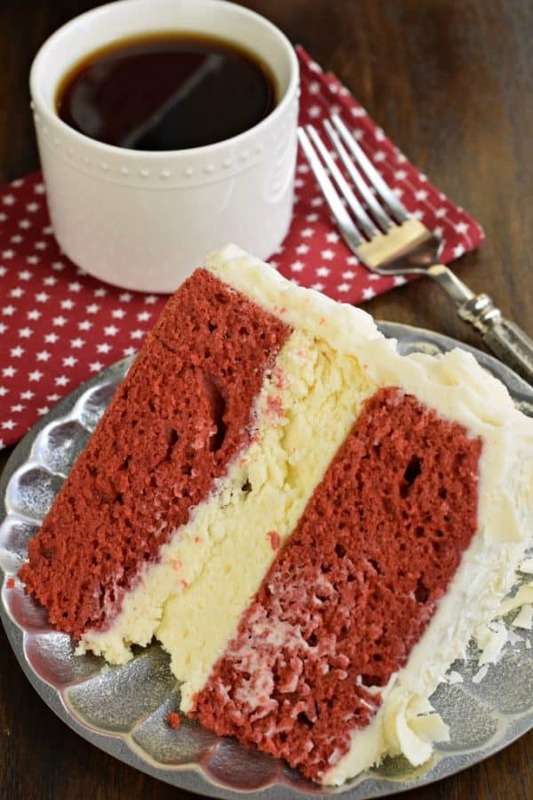 You’ve created a Red Velvet Cheesecake Cake! Salted Caramel Chocolate Cheesecake Cake is another perfect option during cooler fall weather. During the holidays, I love Eggnog Cheesecake Cake and Chocolate Peppermint Cheesecake Cake. I have even turned breakfast into dessert with Cinnamon Roll Cheesecake Cake! What’s not to love about this Chocolate Peanut Butter Cheesecake Cake? This stunning cake has layers of homemade chocolate cake and peanut butter cheesecake. Topped with a creamy peanut butter frosting and dark chocolate ganache, this cake is sure to satisfy that sweet tooth! If you LOVE this recipe, be sure to stop on over in my Pinterest Community to share a picture of YOUR dish! Or share it on Instagram and tag me #shugarysweets so I can see it! The BEST Red Velvet Cheesecake Cake recipe starts with two layers of homemade red velvet cake with a layer of cheesecake in the middle. Topped with delicious cream cheese frosting and white chocolate curls, you'll want to make this cake for friends and family every holiday! Start by making the cheesecake. Preheat oven to 325 degrees. Fill a large roasting pan with about one inch of water and place it in the lower 2/3 of the oven. Prepare springform pan by spraying pan with nonstick baking spray and line bottom (inside) with a circle of parchment paper. Beat cream cheese with granulated sugar for 2-3 minutes until creamy. Add in salt and eggs, one at a time, beating well after each addition. Beat in sour cream, heavy cream and vanilla. Pour into prepared 9-inch springform pan. Place pan in center of oven. When cooled,remove springform pan and cover cheesecake with plastic wrap. Place cheesecake into the freezer for several hours or overnight. For the cake, in a mixing bowl, blend oil, buttermilk, eggs, vanilla, vinegar and food coloring until combined. Slowly add in dry ingredients. Pour cake batter into 9-inch cake pans that have been sprayed with baking spray and have parchment paper circles in the bottom. Bake in a 350 degree oven for 32-34 minutes, until toothpick comes out clean. 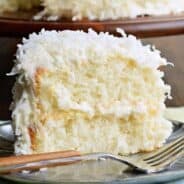 Remove cakes from pan and cool completely. For the frosting, beat butter and cream cheese for several minutes. Add in vanilla, powdered sugar, and heavy cream. Beat for 3-4 minutes until fluffy. 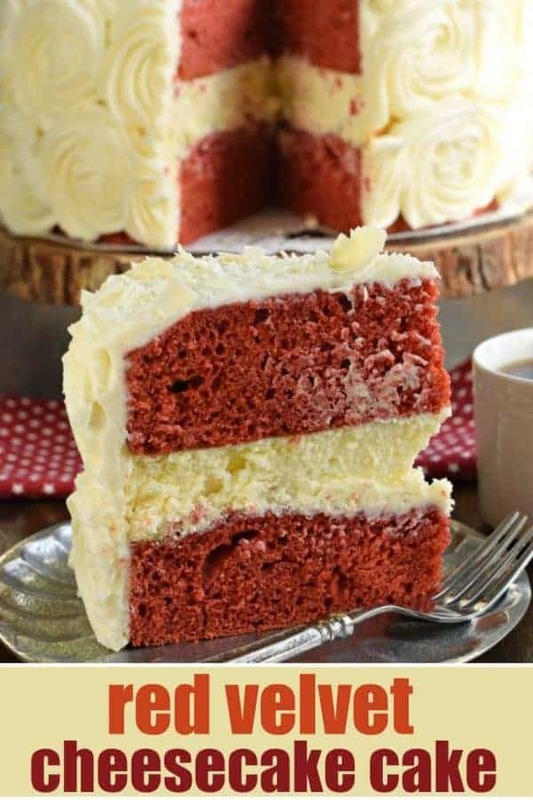 To assemble cake, place one layer of red velvet cake on a cake plate. Top with frozen cheesecake (make sure to remove parchment paper circles) and place second layer of cake on top. Frost generously. Refrigerate covered cake until ready to serve! Cake and Cheesecake layers can be made in advance and frozen until ready to assemble. What a delicious looking 2-in-one cake! And you’re right! It’s perfect for Valentine’s Day. I love to make cheesecake and the thought of adding it to the center of a cake is brilliant. I’m also going to have to look up those bake even strips. What a cool idea! This is such a beautiful cake. It’s perfect for Valentine’s Day! I signed up to your website originally for the Keto Soup recipes not sweets. If I’m always going to receive sugar recipes then take me off your e-mail list. So far I’m very disappointed. You can unsubscribe at any time. My website is called “Shugary Sweets” so you will receive dessert recipes! Rave reviews every time I make this! Incredible to say the least. This cake is utterly amazing. Love the layer of cheesecake in the middle. To die for! What a gorgeous color! I am saving this for Valentine’s Day!